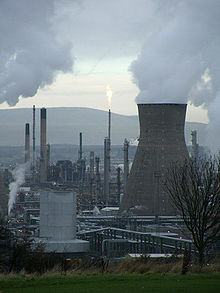 A petrochemical refinery in Grangemouth, Scotland. The Chinese were among the first civilizations to refine oil. During 512 A.D. and 518 A.D., in the late Northern Wei Dynasty, the Chinese geographer, writer, and politician Li Daoyuan introduced the process of refining oil into various lubricants in his famous work Commentary on the Water Classic. During the first century AD, the Chinese were among the first peoples to refine oil for use as an energy source. During the Northern Song Dynasty, a workshop called the "Fierce Oil Workshop", was established in the city of Kaifeng to produce refined oil for the Song military as a weapon. The troops would then fill iron cans with refined oil and throw them toward the enemy troops, causing a fire - effectively the world's first "fire bomb". The workshop was one of the world's earliest oil refining factories where thousands of people worked to produce Chinese oil powered weaponry. Prior to the nineteenth century, petroleum was known and utilized in various fashions in Babylon, Egypt, China, Philippines, Rome and Azerbaijan. However, the modern history of the petroleum industry is said to have begun in 1846 when Abraham Gessner of Nova Scotia, Canada devised a process to produce kerosene from coal. Shortly thereafter, in 1854, Ignacy Łukasiewicz began producing kerosene from hand-dug oil wells near the town of Krosno, Poland. The first large petroleum refinery was built in Ploiești, Romania in 1856 using the abundant oil available in Romania. In North America, the first oil well was drilled in 1858 by James Miller Williams in Oil Springs, Ontario, Canada. In the United States, the petroleum industry began in 1859 when Edwin Drake found oil near Titusville, Pennsylvania. The industry grew slowly in the 1800s, primarily producing kerosene for oil lamps. In the early twentieth century, the introduction of the internal combustion engine and its use in automobiles created a market for gasoline that was the impetus for fairly rapid growth of the petroleum industry. The early finds of petroleum like those in Ontario and Pennsylvania were soon outstripped by large oil "booms" in Oklahoma, Texas and California. Samuel Kier established America's first oil refinery in Pittsburgh on Seventh avenue near Grant Street, in 1853. Polish pharmacist and inventor Ignacy Łukasiewicz established an oil refinery in Jasło, then part of the Austro-Hungarian Empire (now in Poland) in 1854. The first large refinery opened at Ploiești, Romania, in 1856-1857. After being taken over by Nazi Germany, the Ploiești refineries were bombed in Operation Tidal Wave by the Allies during the Oil Campaign of World War II. Another close contender for the title of hosting the world's oldest oil refinery is Salzbergen in Lower Saxony, Germany. Salzbergen's refinery was opened in 1860. At one point, the refinery in Ras Tanura, Saudi Arabia owned by Saudi Aramco was claimed to be the largest oil refinery in the world. For most of the 20th century, the largest refinery was the Abadan Refinery in Iran. This refinery suffered extensive damage during the Iran–Iraq War. Since 25 December 2008, the world's largest refinery complex is the Jamnagar Refinery Complex, consisting of two refineries side by side operated by Reliance Industries Limited in Jamnagar, India with a combined production capacity of 1,240,000 barrels per day (197,000 m3/d). PDVSA's Paraguaná Refinery Complex in Paraguaná Peninsula, Venezuela with a capacity of 940,000 bbl/d (149,000 m3/d) and SK Energy's Ulsan in South Korea with 840,000 bbl/d (134,000 m3/d) are the second and third largest, respectively. Prior to World War II in the early 1940s, most petroleum refineries in the United States consisted simply of crude oil distillation units (often referred to as atmospheric crude oil distillation units). Some refineries also had vacuum distillation units as well as thermal cracking units such as visbreakers (viscosity breakers, units to lower the viscosity of the oil). All of the many other refining processes discussed below were developed during the war or within a few years after the war. They became commercially available within 5 to 10 years after the war ended and the worldwide petroleum industry experienced very rapid growth. The driving force for that growth in technology and in the number and size of refineries worldwide was the growing demand for automotive gasoline and aircraft fuel. In the United States, for various complex economic and political reasons, the construction of new refineries came to a virtual stop in about the 1980s. However, many of the existing refineries in the United States have revamped many of their units and/or constructed add-on units in order to: increase their crude oil processing capacity, increase the octane rating of their product gasoline, lower the sulfur content of their diesel fuel and home heating fuels to comply with environmental regulations and comply with environmental air pollution and water pollution requirements. The size of oil refining market in 2017 was valued over USD 6 trillion in 2017 and is set to witness a consumption of over 100 million barrels per day (MBPD) by 2024. Oil refining market will witness an appreciable growth because of rapid industrialization and economic transformation. Changing demographics, growing population and improvement in living standards across developing nations are some of factors positively influencing the industry landscape. Today, national and state legislation require refineries to meet stringent air and water cleanliness standards. In fact, oil companies in the U.S. perceive obtaining a permit to build a modern refinery to be so difficult and costly that no new refineries were built (though many have been expanded) in the U.S. from 1976 until 2014, when the small Dakota Prairie Refinery in North Dakota began operation. More than half the refineries that existed in 1981 are now closed due to low utilization rates and accelerating mergers. As a result of these closures total US refinery capacity fell between 1981 and 1995, though the operating capacity stayed fairly constant in that time period at around 15,000,000 barrels per day (2,400,000 m3/d). Increases in facility size and improvements in efficiencies have offset much of the lost physical capacity of the industry. In 1982 (the earliest data provided), the United States operated 301 refineries with a combined capacity of 17.9 million barrels (2,850,000 m3) of crude oil each calendar day. In 2010, there were 149 operable U.S. refineries with a combined capacity of 17.6 million barrels (2,800,000 m3) per calendar day. By 2014 the number of refinery had reduced to 140 but the total capacity increased to 18.02 million barrels (2,865,000 m3) per calendar day. Indeed, in order to reduce operating costs and depreciation, refining is operated in fewer sites but of bigger capacity. In 2009 through 2010, as revenue streams in the oil business dried up and profitability of oil refineries fell due to lower demand for product and high reserves of supply preceding the economic recession, oil companies began to close or sell the less profitable refineries. Petroleum fossil fuels are burned in internal combustion engines to provide power for ships, automobiles, aircraft engines, lawn mowers, dirt bikes, and other machines. Different boiling points allow the hydrocarbons to be separated by distillation. Since the lighter liquid products are in great demand for use in internal combustion engines, a modern refinery will convert heavy hydrocarbons and lighter gaseous elements into these higher value products. The oil refinery in Haifa, Israel is capable of processing about 9 million tons (66 million barrels) of crude oil a year. Its two cooling towers are landmarks of the city's skyline. Once separated and purified of any contaminants and impurities, the fuel or lubricant can be sold without further processing. Smaller molecules such as isobutane and propylene or butylenes can be recombined to meet specific octane requirements by processes such as alkylation, or more commonly, dimerization. The octane grade of gasoline can also be improved by catalytic reforming, which involves removing hydrogen from hydrocarbons producing compounds with higher octane ratings such as aromatics. Intermediate products such as gasoils can even be reprocessed to break a heavy, long-chained oil into a lighter short-chained one, by various forms of cracking such as fluid catalytic cracking, thermal cracking, and hydrocracking. The final step in gasoline production is the blending of fuels with different octane ratings, vapor pressures, and other properties to meet product specifications. Another method for reprocessing and upgrading these intermediate products (residual oils) uses a devolatilization[permanent dead link] process to separate usable oil from the waste asphaltene material. Crude oil is separated into fractions by fractional distillation. The fractions at the top of the fractionating column have lower boiling points than the fractions at the bottom. The heavy bottom fractions are often cracked into lighter, more useful products. All of the fractions are processed further in other refining units. Because technical reasons and environment protection demand a very low sulfur content in all but the heaviest products, it is transformed to hydrogen sulfide via catalytic hydrodesulfurization and removed from the product stream via amine gas treating. Using the Claus process, hydrogen sulfide is afterwards transformed to elementary sulfur to be sold to the chemical industry. The rather large heat energy freed by this process is directly used in the other parts of the refinery. Often an electrical power plant is combined into the whole refinery process to take up the excess heat. Petroleum products are usually grouped into four categories: light distillates (LPG, gasoline, naphtha), middle distillates (kerosene, jet fuel, diesel), heavy distillates and residuum (heavy fuel oil, lubricating oils, wax, asphalt). These require blending various feedstocks, mixing appropriate additives, providing short term storage, and preparation for bulk loading to trucks, barges, product ships, and railcars. This classification is based on the way crude oil is distilled and separated into fractions. Gaseous fuel such as Liquified petroleum gas and propane, stored and shipped in liquid form under pressure. Lubricants (produces light machine oils, motor oils, and greases, adding viscosity stabilizers as required), usually shipped in bulk to an offsite packaging plant. Paraffin wax, used in the packaging of frozen foods, among others. May be shipped in bulk to a site to prepare as packaged blocks. Used for wax emulsions, construction board, matches, candles, rust protection, and vapor barriers. Sulfur (or sulfuric acid), byproducts of sulfur removal from petroleum which may have up to a couple percent sulfur as organic sulfur-containing compounds. Sulfur and sulfuric acid are useful industrial materials. Sulfuric acid is usually prepared and shipped as the acid precursor oleum. Bulk tar shipping for offsite unit packaging for use in tar-and-gravel roofing. Asphalt used as a binder for gravel to form asphalt concrete, which is used for paving roads, lots, etc. An asphalt unit prepares bulk asphalt for shipment. Petroleum coke, used in specialty carbon products like electrodes or as solid fuel. Petrochemicals are organic compounds that are the ingredients for the chemical industry, ranging from polymers and pharmaceuticals, including ethylene and benzene-toluene-xylenes ("BTX") which are often sent to petrochemical plants for further processing in a variety of ways. The petrochemicals may be olefins or their precursors, or various types of aromatic petrochemicals. Desalter unit washes out salt from the crude oil before it enters the atmospheric distillation unit. Crude Oil Distillation unit (Atmospheric distillation): Distills the incoming crude oil into various fractions for further processing in other units. See continuous distillation. Vacuum distillation further distills the residue oil from the bottom of the crude oil distillation unit. The vacuum distillation is performed at a pressure well below atmospheric pressure. Naphtha hydrotreater unit uses hydrogen to desulfurize naphtha from atmospheric distillation. Must hydrotreat the naphtha before sending to a catalytic reformer unit. Catalytic reformer converts the desulfurized naphtha molecules into higher-octane molecules to produce reformate (reformer product). The reformate has higher content of aromatics and cyclic hydrocarbons which is a component of the end-product gasoline or petrol. An important byproduct of a reformer is hydrogen released during the catalyst reaction. The hydrogen is used either in the hydrotreaters or the hydrocracker. Distillate hydrotreater desulfurizes distillates (such as diesel) after atmospheric distillation. Uses hydrogen to desulfurize the naphtha fraction from the crude oil distillation or other units within the refinery. Fluid Catalytic Cracker (FCC) upgrades the heavier, higher-boiling fractions from the crude oil distillation by converting them into lighter and lower boiling, more valuable products. Hydrocracker uses hydrogen to upgrade heavy residual oils from the vacuum distillation unit by thermally cracking them into lighter, more valuable reduced viscosity products. Merox desulfurize LPG, kerosene or jet fuel by oxidizing mercaptans to organic disulfides. Alternative processes for removing mercaptans are known, e.g. doctor sweetening process and caustic washing. Coking units (delayed coking, fluid coker, and flexicoker) process very heavy residual oils into gasoline and diesel fuel, leaving petroleum coke as a residual product. Alkylation unit uses sulfuric acid or hydrofluoric acid to produce high-octane components for gasoline blending. Converts isobutane and butylenes into alkylate, which is a very high-octane component of the end-product gasoline or petrol. Dimerization unit converts olefins into higher-octane gasoline blending components. For example, butenes can be dimerized into isooctene which may subsequently be hydrogenated to form isooctane. There are also other uses for dimerization. Gasoline produced through dimerization is highly unsaturated and very reactive. It tends spontaneously to form gums. For this reason the effluent from the dimerization need to be blended into the finished gasoline pool immediately or hydrogenated. Isomerization converts linear molecules such as normal pentane to higher-octane branched molecules for blending into gasoline or feed to alkylation units. Also used to convert linear normal butane into isobutane for use in the alkylation unit. Steam reforming converts natural gas into hydrogen for the hydrotreaters and/or the hydrocracker. Liquified gas storage vessels store propane and similar gaseous fuels at pressure sufficient to maintain them in liquid form. These are usually spherical vessels or "bullets" (i.e., horizontal vessels with rounded ends). Amine gas treater, Claus unit, and tail gas treatment convert hydrogen sulfide from hydrodesulfurization into elemental sulfur. The large majority of the 64,000,000 metric tons of sulfur produced worldwide in 2005 was byproduct sulfur from petroleum refining and natural gas processing plants. Sour water stripper Uses steam to remove hydrogen sulfide gas from various wastewater streams for subsequent conversion into end-product sulfur in the Claus unit. Cooling towers circulate cooling water, boiler plants generates steam for steam generators, and instrument air systems include pneumatically operated control valves and an electrical substation. Wastewater collection and treating systems consist of API separators, dissolved air flotation (DAF) units and further treatment units such as an activated sludge biotreater to make water suitable for reuse or for disposal. Solvent refining use solvent such as cresol or furfural to remove unwanted, mainly aromatics from lubricating oil stock or diesel stock. Solvent dewaxing remove the heavy waxy constituents petrolatum from vacuum distillation products. Liquified gas (LPG) storage vessels for propane and similar gaseous fuels at a pressure sufficient to maintain them in liquid form. These are usually spherical vessels or bullets (horizontal vessels with rounded ends). Storage tanks for storing crude oil and finished products, usually vertical, cylindrical vessels with some sort of vapour emission control and surrounded by an earthen berm to contain spills. There are many process configurations other than that depicted above. For example, the vacuum distillation unit may also produce fractions that can be refined into end products such as: spindle oil used in the textile industry, light machinery oil, motor oil, and various waxes. The crude oil distillation unit (CDU) is the first processing unit in virtually all petroleum refineries. The CDU distills the incoming crude oil into various fractions of different boiling ranges, each of which are then processed further in the other refinery processing units. The CDU is often referred to as the atmospheric distillation unit because it operates at slightly above atmospheric pressure. Below is a schematic flow diagram of a typical crude oil distillation unit. The incoming crude oil is preheated by exchanging heat with some of the hot, distilled fractions and other streams. It is then desalted to remove inorganic salts (primarily sodium chloride). Following the desalter, the crude oil is further heated by exchanging heat with some of the hot, distilled fractions and other streams. It is then heated in a fuel-fired furnace (fired heater) to a temperature of about 398 °C and routed into the bottom of the distillation unit. The cooling and condensing of the distillation tower overhead is provided partially by exchanging heat with the incoming crude oil and partially by either an air-cooled or water-cooled condenser. 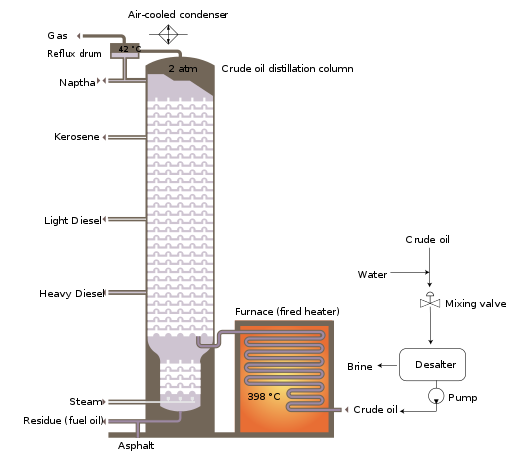 Additional heat is removed from the distillation column by a pumparound system as shown in the diagram below. As shown in the flow diagram, the overhead distillate fraction from the distillation column is naphtha. The fractions removed from the side of the distillation column at various points between the column top and bottom are called sidecuts. Each of the sidecuts (i.e., the kerosene, light gas oil and heavy gas oil) is cooled by exchanging heat with the incoming crude oil. All of the fractions (i.e., the overhead naphtha, the sidecuts and the bottom residue) are sent to intermediate storage tanks before being processed further. Schematic flow diagram of a typical crude oil distillation unit as used in petroleum crude oil refineries. The site has to be reasonably far from residential areas. Infrastructure should be available for supply of raw materials and shipment of products to markets. Energy to operate the plant should be available. Facilities should be available for waste disposal. Refineries which use a large amount of steam and cooling water need to have an abundant source of water. Oil refineries therefore are often located nearby navigable rivers or on a sea shore, nearby a port. Such location also gives access to transportation by river or by sea. The advantages of transporting crude oil by pipeline are evident, and oil companies often transport a large volume of fuel to distribution terminals by pipeline. Pipeline may not be practical for products with small output, and rail cars, road tankers, and barges are used. Petrochemical plants and solvent manufacturing (fine fractionating) plants need spaces for further processing of a large volume of refinery products for further processing, or to mix chemical additives with a product at source rather than at blending terminals. Fire-extinguishing operations after the Texas City Refinery explosion. The refining process releases a number of different chemicals into the atmosphere (see AP 42 Compilation of Air Pollutant Emission Factors) and a notable odor normally accompanies the presence of a refinery. Aside from air pollution impacts there are also wastewater concerns, risks of industrial accidents such as fire and explosion, and noise health effects due to industrial noise. Many governments worldwide have mandated restrictions on contaminants that refineries release, and most refineries have installed the equipment needed to comply with the requirements of the pertinent environmental protection regulatory agencies. In the United States, there is strong pressure to prevent the development of new refineries, and no major refinery has been built in the country since Marathon's Garyville, Louisiana facility in 1976. However, many existing refineries have been expanded during that time. Environmental restrictions and pressure to prevent construction of new refineries may have also contributed to rising fuel prices in the United States. Additionally, many refineries (more than 100 since the 1980s) have closed due to obsolescence and/or merger activity within the industry itself. Environmental and safety concerns mean that oil refineries are sometimes located some distance away from major urban areas. Nevertheless, there are many instances where refinery operations are close to populated areas and pose health risks. In California's Contra Costa County and Solano County, a shoreline necklace of refineries, built in the early 20th century before this area was populated, and associated chemical plants are adjacent to urban areas in Richmond, Martinez, Pacheco, Concord, Pittsburg, Vallejo and Benicia, with occasional accidental events that require "shelter in place" orders to the adjacent populations. A number of refineries are located in Sherwood Park, Alberta, directly adjacent to the City of Edmonton. The Edmonton metro area has a population of over 1,000,000 residents. NIOSH criteria for occupational exposure to refined petroleum solvents have been available since 1977. Modern petroleum refining involves a complicated system of interrelated chemical reactions that produce a wide variety of petroleum-based products. Many of these reactions require precise temperature and pressure parameters. The equipment and monitoring required to ensure the proper progression of these processes is complex, and has evolved through the advancement of the scientific field of petroleum engineering. The wide array of high pressure and/or high temperature reactions, along with the necessary chemical additives or extracted contaminants, produces an astonishing number of potential health hazards to the oil refinery worker. Through the advancement of technical chemical and petroleum engineering, the vast majority of these processes are automated and enclosed, thus greatly reducing the potential health impact to workers. However, depending on the specific process in which a worker is engaged, as well as the particular method employed by the refinery in which he/she works, significant health hazards remain. Although U.S. occupational injuries were not routinely tracked/reported at the time, reports of the health impacts of working in an oil refinery can be found as early as the 1800s. For instance, an explosion in a Chicago refinery killed 20 workers in 1890. Since then, numerous fires, explosions, and other significant events have from time to time drawn the public's attention to the health of oil refinery workers. Such events continue today, with explosions reported in refineries in Wisconsin and Germany in 2018. However, there are many less visible hazards that endanger oil refinery workers. System failures (leaks, explosions, etc.). Standard inspection, product sampling, process turnaround, or equipment maintenance/cleaning activities. BTX stands for benzene, toluene, xylene. This is a group of common volatile organic compounds (VOC's) that are found in the oil refinery environment, and serve as a paradigm for more in depth discussion of occupational exposure limits, chemical exposure and surveillance among refinery workers. The most important route of exposure for BTEX chemicals is inhalation due to the low boiling point of these chemicals. The majority of the gaseous production of BTEX occurs during tank cleaning and fuel transfer, which causes offgassing of these chemicals into the air. It should be noted that exposure can also occur through ingestion via contaminated water, but this is unlikely in an occupational setting. Dermal exposure and absorption is also possible, but is again less likely in an occupational setting where appropriate personal protective equipment is in place. OSHA, NIOSH, and ACGIH have all established occupational exposure limits (OEL's) for many of the chemicals above that workers may be exposed to in petroleum refineries. Benzene, in particular, has multiple biomarkers that can be measured to determine exposure. Benzene itself can be measured in the breath, blood, and urine, and metabolites such as phenol, t,t-muconic acid (t,tMA) and S-phenylmercapturic acid (sPMA) can be measured in urine. In addition to monitoring the exposure levels via these biomarkers, employers are required by OSHA to perform regular blood tests on workers to test for early signs of some of the feared hematologic outcomes, of which the most widely recognized is leukemia. Required testing includes complete blood count with cell differentials and peripheral blood smear "on a regular basis". The utility of these tests is supported by formal scientific studies. Solvent Extraction and Dewaxing Phenol Neurologic symptoms, muscle weakness, skin irritation. Glycols Central nervous system depression, weakness, irritation of the eyes, skin, nose, throat. Methyl ethyl ketone Airway irritation, cough, dyspnea, pulmonary edema. Thermal Cracking Hydrogen sulfide Irritation of the respiratory tract, headache, visual disturbances, eye pain. Carbon monoxide Electrocardiogram changes, cyanosis, headache, weakness. Ammonia Respiratory tract irritation, dysnpea, pulmonary edema, skin burns. Catalytic Cracking Hydrogen sulfide Irritation of the respiratory tract, headache, visual disturbances, eye pain. Phenol Neurologic symptoms, muscle weakness, skin irritation. Mercaptan Cyanosis and narcosis, irritation of the respiratory tract, skin, and eyes. Nickel carbonyl Headache, teratogen, weakness, chest/abdominal pain. Lung and nasal cancer. Catalytic Reforming Hydrogen sulfide Irritation of the respiratory tract, headache, visual disturbances, eye pain. Benzene Leukemia, nervous system effects, respiratory symptoms. Isomerization Hydrochloric acid Skin damage, respiratory tract irritation, eye burns. Hydrogen chloride Respiratory tract irritation, skin irritation, eye burns. Polymerization Sodium hydroxide Irritation of the mucous membranes, skin. Pneumonitis. Phosphoric acid Skin, eye, respiratory irritation. Alkylation Sulfuric acid Eye and skin burns, pulmonary edema. Hydrofluoric acid Bone changes, skin burns, respiratory tract damage. Sweetening and Treating Hydrogen sulfide Irritation of the respiratory tract, headache, visual disturbances, eye pain. Sodium hydroxide Irritation of the mucous membranes, skin. Pneumonitis. Unsaturated Gas Recovery Monoethanolamine (MEA) Drowsiness, irritation of the eyes, skin, and respiratory tract. Diethanolamine (DEA) Corneal necrosis, skin burns, irritation of the eyes, nose, throat. Amine Treatment Monoethanolamine (MEA) Drowsiness, irritation of the eyes, skin, and respiratory tract. Hydrogen sulfide Irritation of the respiratory tract, headache, visual disturbances, eye pain. Carbon dioxide Headache, dizziness, paresthesia, malaise, tachycardia. Saturated gas extraction Hydrogen sulfide Irritation of the respiratory tract, headache, visual disturbances, eye pain. Diethanolamine Corneal necrosis, skin burns, irritation of the eyes, nose, throat. Hydrogen Production Carbon monoxide Electrocardiogram changes, cyanosis, headache, weakness. Workers are at risk of physical injuries due to the large number of high-powered machines in the relatively close proximity of the oil refinery. The high pressure required for many of the chemical reactions also presents the possibility of localized system failures resulting in blunt or penetrating trauma from exploding system components. However, Bureau of Labor (BLS) statistical reports indicate that petroleum refinery workers have a significantly lower rate of occupational injury (0.7 OSHA-recordable cases per 100 full-time workers) than all industries (3.1), oil and gas extraction (1.0), and petroleum manufacturing in general (1.6). Heat is also a hazard The temperature required for the proper progression of certain reactions in the refining process can reach 1600 degrees F. As with chemicals, the operating system is designed to safely contain this hazard without injury to the worker. However, in system failures this is a potent threat to workers’ health. Concerns include both direct injury through a heat illness or injury, as well as the potential for devastating burns should the worker come in contact with super-heated reagents/equipment. Noise is another hazard. Refineries can be very loud environments, and have previously been shown to be associated with hearing loss among workers. The interior environment of an oil refinery can reach levels in excess of 90 dB. An average of 90 dB is the OSHA Permissible Exposure Limit (PEL) for an 8 hour work-day. Noise exposures that average greater than 85 dB over an 8 hour require a hearing conservation program to regularly evaluate workers' hearing and to promote its protection. Regular evaluation of workers’ auditory capacity and faithful use of properly vetted hearing protection are essential parts of such programs. While not specific to the industry, oil refinery workers may also be at risk for hazards such as vehicle-related accidents, machinery-associated injuries, work in a confined space, explosions/fires, ergonomic hazards, shift-work related sleep disorders, and falls. The theory of hierarchy of controls can be applied to petroleum refineries and their efforts to ensure worker safety. Elimination and substitution are unlikely in petroleum refineries, as many of the raw materials, waste products, and finished products are hazardous in one form or another (e.g. flammable, carcinogenic). Examples of engineering controls include a fire detection/extinguishing system, pressure/chemical sensors to detect/predict loss of structural integrity, and adequate maintenance of piping to prevent hydrocarbon-induced corrosion (leading to structural failure). Other examples employed in petroleum refineries include the post-construction protection of steel components with vermiculite to improve heat/fire resistance. Compartmentalization can help to prevent a fire or other systems failure from spreading to affect other areas of the structure, and may help prevent dangerous reactions by keeping difference chemicals separate from one another until they can be safely combined in the proper environment. Administrative controls include careful planning and oversight of the refinery cleaning, maintenance, and turnaround processes. These occur when many of the engineering controls are shut down or suppressed, and may be especially dangerous to workers. Detailed coordination is necessary to ensure that maintenance of one part of the facility will not cause dangerous exposures to those performing the maintenance, or to workers in other areas of the plant. Due to the highly flammable nature of many of the involved chemical, smoking areas are tightly controlled and carefully placed. Personal protective equipment may be necessary depending on the specific chemical being processed or produced. Particular care is needed during sampling of the partially-completed product, tank cleaning, and other high-risk tasks as mentioned above. Such activities may require the use of impervious outer wear, acid hood, disposable coveralls, etc. More generally, all personnel in operating areas should use appropriate hearing and vision protection, avoid clothes made of flammable material (nylon, Dacron, acrylic, or blends), and full-length pants/sleeves. Worker health and safety in oil refineries is closely monitored by both OSHA and NIOSH. CalOSHA has been particularly active in regulating worker health in this industry, and adopted a policy in 2017 that requires petroleum refineries to perform a Hierarchy of Hazard Controls Analysis (see above "Controls" section) for each process safety hazard. Refinery of Slovnaft in Bratislava. Corrosion of metallic components is a major factor of inefficiency in the refining process. Because it leads to equipment failure, it is a primary driver for the refinery maintenance schedule. Corrosion-related direct costs in the U.S. petroleum industry as of 1996 were estimated at US $3.7 billion. Corrosion occurs in various forms in the refining process, such as pitting corrosion from water droplets, embrittlement from hydrogen, and stress corrosion cracking from sulfide attack. From a materials standpoint, carbon steel is used for upwards of 80 per cent of refinery components, which is beneficial due to its low cost. Carbon steel is resistant to the most common forms of corrosion, particularly from hydrocarbon impurities at temperatures below 205 °C, but other corrosive chemicals and environments prevent its use everywhere. Common replacement materials are low alloy steels containing chromium and molybdenum, with stainless steels containing more chromium dealing with more corrosive environments. More expensive materials commonly used are nickel, titanium, and copper alloys. These are primarily saved for the most problematic areas where extremely high temperatures and/or very corrosive chemicals are present. Corrosion is fought by a complex system of monitoring, preventative repairs and careful use of materials. Monitoring methods include both offline checks taken during maintenance and online monitoring. Offline checks measure corrosion after it has occurred, telling the engineer when equipment must be replaced based on the historical information they have collected. This is referred to as preventative management. Online systems are a more modern development, and are revolutionizing the way corrosion is approached. There are several types of online corrosion monitoring technologies such as linear polarization resistance, electrochemical noise and electrical resistance. Online monitoring has generally had slow reporting rates in the past (minutes or hours) and been limited by process conditions and sources of error but newer technologies can report rates up to twice per minute with much higher accuracy (referred to as real-time monitoring). This allows process engineers to treat corrosion as another process variable that can be optimized in the system. Immediate responses to process changes allow the control of corrosion mechanisms, so they can be minimized while also maximizing production output. In an ideal situation having online corrosion information that is accurate and real-time will allow conditions that cause high corrosion rates to be identified and reduced. This is known as predictive management. Materials methods include selecting the proper material for the application. In areas of minimal corrosion, cheap materials are preferable, but when bad corrosion can occur, more expensive but longer lasting materials should be used. Other materials methods come in the form of protective barriers between corrosive substances and the equipment metals. These can be either a lining of refractory material such as standard Portland cement or other special acid-resistant cements that are shot onto the inner surface of the vessel. Also available are thin overlays of more expensive metals that protect cheaper metal against corrosion without requiring lots of material. ^ a b c Gary, J.H. & Handwerk, G.E. (1984). Petroleum Refining Technology and Economics (2nd ed.). Marcel Dekker, Inc. ISBN 978-0-8247-7150-8. ^ a b c Leffler, W.L. (1985). Petroleum refining for the nontechnical person (2nd ed.). PennWell Books. ISBN 978-0-87814-280-4. ^ James G, Speight (2006). The Chemistry and Technology of Petroleum (Fourth ed.). CRC Press. 0-8493-9067-2. ^ "Exxon starts world's 1st crude-cracking petrochemical unit". Reuters. 2014-01-08. Retrieved 13 April 2018. ^ "Converting Crude to Ethylene Technology Breakthrough". Retrieved 13 April 2018. ^ a b c Deng, Yinke (2011). Ancient Chinese Inventions. p. 40. ISBN 978-0521186926. ^ a b Spataru, Catalina (2017). Whole Energy System Dynamics: Theory, Modelling and Policy. Routledge. ISBN 978-1138799905. ^ Deng, Yinke (2011). Ancient Chinese Inventions. p. 41. ISBN 978-0521186926. ^ Habashi, Fathi (2000). "The First Oil Well in the World" (PDF). Bulletin for the History of Chemistry. 25: 64–66. ^ Brian Black (2000). Petrolia: the landscape of America's first oil boom. Johns Hopkins University Press. ISBN 978-0-8018-6317-2. ^ The American Manufacturer and Iron World "Greater Pittsburgh and Allegheny County, Past, Present, Future; The Pioneer Oil Refiner", Original from the New York Public Library: The American Manufacturer and Iron World., 1901. ^ "U.S. Energy Information Administration: Top 10 U.S. Refineries Operable Capacity". Retrieved 2015-01-26. ^ "North Dakota Builds A Refinery, First In The U.S. Since '76". Investor's Business Daily. April 11, 2013. Retrieved August 24, 2014. ^ White Paper on Refining Capacity Archived 2010-05-27 at the Wayback Machine, Federal Trade Commission, April, 2007. ^ "U. S. Operating Crude Oil Distillation Capacity (Thousand Barrels per Day)". Eia.doe.gov. 2011-07-28. Retrieved 2011-11-05. ^ "2011 The U.S. Petroleum Industry: Statistics & Definitions" (PDF). Archived from the original (PDF) on 2011-09-27. Retrieved 2011-11-05. ^ "U.S. Energy Information Administration > Petroleum > Navigator > Refinery Yield". Archived from the original on 2011-03-06. Retrieved 2018-03-04. ^ Beychok, Milton R. (1967). Aqueous Wastes from Petroleum and Petrochemical Plants (1st ed.). John Wiley & Sons. Library of Congress Control Number 67019834. ^ a b Beychok, Milton R. (1967). Aqueous Wastes from Petroleum and Petrochemical Plants (1st ed.). John Wiley & Sons. LCCN 67019834. ^ a b Morata, Thais C; Engel, Terry; Durão, Alvaro; Costa, Thelma RS; Krieg, Edward F; Dunn, Derek E; Lozano, Maria Angelica (January 1997). "Hearing Loss from Combined Exposures among Petroleum Refinery Workers". Scandinavian Audiology. 26 (3): 141–149. doi:10.3109/01050399709074987. ISSN 0105-0397. PMID 9309809. ^ Steve Hargreaves, CNNMoney.com staff writer (2007-04-17). "Behind high gas prices: The refinery crunch". Money.cnn.com. Retrieved 2011-11-05. ^ "Criteria for a Recommended Standard: Occupational Exposure to Refined Petroleum Solvents (77-192)". CDC - NIOSH Publications and Products. June 6, 2014. Retrieved 2016-07-15. ^ Gudde, Nicholas J (2017-02-20). "Adaptation of oil refineries to make modern fuels". Proceedings of the Institution of Mechanical Engineers, Part D: Journal of Automobile Engineering. 232 (1): 5–21. doi:10.1177/0954407016680522. ISSN 0954-4070. ^ Eneh, Onyenekenwa Cyprian (2011-12-01). "A Review on Petroleum: Source, Uses, Processing, Products and the Environment". Journal of Applied Sciences. 11 (12): 2084–2091. Bibcode:2011JApSc..11.2084E. doi:10.3923/jas.2011.2084.2091. ISSN 1812-5654. ^ "Oil Refining and Products". (PDF) Oil Refining and Products. ResearchGate. 4. 2004-12-31. pp. 715–729. Retrieved 2018-11-17. ^ Gary, James (2001). Petroleum Refining: Technology and Economics. New York, NY: Marcel Dekker, Inc. ISBN 978-0-8247-0482-7. ^ Mohaghegh, Shahab D. (2005-04-01). "Recent Developments in Application of Artificial Intelligence in Petroleum Engineering". Journal of Petroleum Technology. 57 (4): 86–91. doi:10.2118/89033-JPT. ISSN 0149-2136. ^ Hsu, Chang Samuel (2017). Handbook of Petroleum Technology. Springer. ISBN 978-3-319-49347-3. ^ "Refinery Safety at a Glance". www.afpm.org. Retrieved 2018-11-17. ^ DIR. "Process Safety Management for Petroleum Refineries". www.dir.ca.gov. Retrieved 2018-11-17. ^ a b c d "Process Safety Management for Petroleum Refineries" (PDF). Occupational Safety and Health Administration. ^ Witter, Roxana Z.; Tenney, Liliana; Clark, Suzanne; Newman, Lee S. (July 2014). "Occupational Exposures in the Oil and Gas Extraction Industry: State of the Science and Research Recommendations". American Journal of Industrial Medicine. 57 (7): 847–856. doi:10.1002/ajim.22316. ISSN 0271-3586. PMC 4469339. PMID 24634090. ^ "33 accidents happened at oil refineries as EPA delayed updating disaster rule, says environmentalist group". Daily Breeze. 2018-04-04. Retrieved 2018-12-11. ^ Harris, Katie (2018-09-01). "Germany oil refinery EXPLOSION: Blast sparks HUGE fire – eight injured and 2,000 evacuated". Express.co.uk. Retrieved 2018-12-11. ^ a b c d e "Oil Refineries and Petrochemical Plants" (PDF). Infrastructure Health & Safety Association. ^ a b "Environmental, Health and Safety Guidelines for Petroleum Refining" (PDF). World Bank Group. November 17, 2016. ^ a b Taek, Kim, Gyoung; Sik, Hwang, Hyun; Lyong, Oh, Sung; Mu, Kim, Byong (2010-01-01). "Case Studies Of Corrosion Failures In Oil Refineries". ^ a b Heraty, Maureen (2013). "Corrosion-Related Accidents in Petroleum Refineries" (PDF). European Commission Joint Research Centre. ^ Vigliani, E.C. ; Forni, Alessandra (1976-02-01). "Benzene and leukemia". Environmental Research. 11 (1): 122–127. Bibcode:1976ER.....11..122V. doi:10.1016/0013-9351(76)90115-8. ISSN 0013-9351. ^ Alderson, M. R.; Rushton, L. (January 1981). "A case-control study to investigate the association between exposure to benzene and deaths from leukaemia in oil refinery workers". British Journal of Cancer. 43 (1): 77–84. doi:10.1038/bjc.1981.11. ISSN 1532-1827. ^ a b Satin, Kenneth P.; Wong, Otto; Yuan, Leslie A.; Bailey, William J.; Newton, Kimberlyw L.; Wen, Chi-Pang; Swencicki, Robert E. (May 1996). "A 50-Year Mortality Follow-up of a Large Cohort of Oil Refinery Workers in Texas". Journal of Occupational and Environmental Medicine. 38 (5): 492–506. doi:10.1097/00043764-199605000-00010. ISSN 1076-2752. PMID 8733641. ^ Gennaro, Valerio; Ceppi, Marcello; Boffetta, Paolo; Fontana, Vincenzo; Perrotta, Alessandra (1994). "Pleural mesothelioma and asbestos exposure among Italian oil refinery workers on JSTOR". Scandinavian Journal of Work, Environment & Health. 20 (3): 213–215. doi:10.5271/sjweh.1406. JSTOR 40966252. ^ Wong, Otto; Raabe, Gerhard K. (2000-08-01). "A Critical Review of Cancer Epidemiology in the Petroleum Industry, with a Meta-analysis of a Combined Database of More Than 350,000 Workers". Regulatory Toxicology and Pharmacology. 32 (1): 78–98. doi:10.1006/rtph.2000.1410. ISSN 0273-2300. PMID 11029272. ^ Baltrėnas, Pranas; Baltrėnaitė, Edita; Serevičienė, Vaida; Pereira, Paulo (November 2011). "Atmospheric BTEX concentrations in the vicinity of the crude oil refinery of the Baltic region". Environmental Monitoring and Assessment. 182 (1–4): 115–127. Bibcode:2014EMA...186.6263B. doi:10.1007/s10661-010-1862-0. ISSN 1573-2959. PMID 21243423. ^ "Estimation of VOC Emission in Petroleum Refinery ETP and Comparative Analysis with Measured VOC Emission Rate" (PDF). www.theijes.com. ISSN 2319-1813. Retrieved 2018-12-11. ^ Heibati, Behzad; Godri Pollitt, Krystal J.; Charati, Jamshid Yazdani; Ducatman, Alan; Shokrzadeh, Mohammad; Karimi, Ali; Mohammadyan, Mahmoud (2018). "(PDF) Biomonitoring-based exposure assessment of benzene, toluene, ethylbenzene and xylene among workers at petroleum distribution facilities". Ecotoxicology and Environmental Safety. 149: 19–25. doi:10.1016/j.ecoenv.2017.10.070. PMID 29145162. Retrieved 2018-12-11. ^ a b Domingo, José L.; Schuhmacher, Marta; López, Eva (2008-05-01). "Human health risks of petroleum-contaminated groundwater". Environmental Science and Pollution Research. 15 (3): 278–288. Bibcode:2016ESPR...2311471P. doi:10.1065/espr2007.02.390. ISSN 1614-7499. ^ a b "OSHA Annotated PELs | Occupational Safety and Health Administration". www.osha.gov. Retrieved 2018-12-10. ^ "OSHA Annotated PELs | Occupational Safety and Health Administration". www.osha.gov. Retrieved 2018-12-10. ^ "Annotated PELs Table Z-3 | Occupational Safety and Health Administration". www.osha.gov. Retrieved 2018-12-10. ^ Weisel, Clifford P. (2010-03-19). "Benzene exposure: An overview of monitoring methods and their findings". Chemico-Biological Interactions. 184 (1–2): 58–66. doi:10.1016/j.cbi.2009.12.030. ISSN 0009-2797. PMC 4009073. PMID 20056112. ^ "Medical surveillance guidelines for Benzene - 1910.1028 App C | Occupational Safety and Health Administration". www.osha.gov. Retrieved 2018-12-12. ^ Turk, Rajka; Zavalić, Marija; Bogadi‐Šare, Ana (2003-11-01). "Utility of a routine medical surveillance program with benzene exposed workers". American Journal of Industrial Medicine. 44 (5): 467–473. doi:10.1002/ajim.10296. ISSN 1097-0274. PMID 14571510. ^ a b "OSHA Technical Manual (OTM) | Section IV: Chapter 2 - Petroleum Refining Process | Occupational Safety and Health Administration". www.osha.gov. Retrieved 2018-11-17. ^ "CDC - NIOSH Pocket Guide to Chemical Hazards (NPG) Search". www.cdc.gov. 2018-10-18. Retrieved 2018-11-17. ^ a b Sittert, N. J. van; Boogaard, P. J. (1995-09-01). "Biological monitoring of exposure to benzene: a comparison between S-phenylmercapturic acid, trans,trans-muconic acid, and phenol". Occupational and Environmental Medicine. 52 (9): 611–620. doi:10.1136/oem.52.9.611. ISSN 1470-7926. PMC 1128315. PMID 7550802. ^ McClellan, William A.; Wong, Otto; Gibson, Roy L.; Weiss, Nancy S.; Tsai, Shan P.; Wen, C. P. (1985-01-01). "Long-Term Mortality Study of Oil Refinery Workers. IV. Exposure to the Lubricating-Dewaxing Process". JNCI Journal of the National Cancer Institute. 74 (1): 11–18. doi:10.1093/jnci/74.1.11. ISSN 0027-8874. ^ Ikeda, M.; Higashikawa, K.; Sakamoto, K.; Miyama, Y.; Takeuchi, A.; Zhang, Z.-W.; Kawai, T. (2003-01-01). "Methyl isobutyl ketone and methyl ethyl ketone in urine as biological markers of occupational exposure to these solvents at low levels". International Archives of Occupational and Environmental Health. 76 (1): 17–23. doi:10.1007/s00420-002-0374-9. ISSN 1432-1246. PMID 12592578. ^ a b c d e f Hessel, Patrick A.; Herbert, F. Alex; Melenka, Lyle S.; Yoshida, Ken; Nakaza, Mahashiro (1997-05-01). "Lung health in relation to hydrogen sulfide exposure in oil and gas workers in Alberta, Canada". American Journal of Industrial Medicine. 31 (5): 554–557. doi:10.1002/(SICI)1097-0274(199705)31:5<554::AID-AJIM9>3.0.CO;2-T. ISSN 1097-0274. ^ a b c Madani, Ismail M.; Khalfan, Sameer; Khalfan, Hussain; Jidah, Jasim; Nabeel Aladin, M. (1992-04-01). "Occupational exposure to carbon monoxide during charcoal meat grilling". Science of the Total Environment. 114: 141–147. Bibcode:1992ScTEn.114..141M. doi:10.1016/0048-9697(92)90420-W. ISSN 0048-9697. ^ a b Thurston, Sally W.; Ryan, Louise; Christiani, David C.; Snow, Rachel; Carlson, Jerold; You, Liangya; Cui, Shangcong; Ma, Guohong; Wang, Lihua (2000-11-01). "Petrochemical exposure and menstrual disturbances". American Journal of Industrial Medicine. 38 (5): 555–564. doi:10.1002/1097-0274(200011)38:5<555::AID-AJIM8>3.0.CO;2-E. ISSN 1097-0274. ^ Tjalvin, Gro (2018-02-02). Health in the aftermath of a malodorous chemical explosion: Subjective health complaints and post-traumatic stress symptoms among workers. The University of Bergen. ISBN 9788230838488. ^ Bråtveit, M.; Moen, B. E.; Hollund, B. E.; Lygre, S. H. L.; Tjalvin, G. (2015-04-01). "Health complaints after a malodorous chemical explosion: a longitudinal study". Occupational Medicine. 65 (3): 202–209. doi:10.1093/occmed/kqu203. ISSN 0962-7480. PMID 25638209. ^ Kincaid, John F.; Sunderman, F. William (1954-07-03). "NICKEL POISONING: II. STUDIES ON PATIENTS SUFFERING FROM ACUTE EXPOSURE TO VAPORS OF NICKEL CARBONYL". Journal of the American Medical Association. 155 (10): 889–894. doi:10.1001/jama.1954.03690280013003. ISSN 0002-9955. ^ Wong, Otto; Raabe, Gerhard K. (May 2000). "Non-Hodgkin's Lymphoma and Exposure to Benzene in a Multinational Cohort of More Than 308,000 Petroleum Workers, 1937 to 1996". Journal of Occupational and Environmental Medicine. 42 (5): 554–68. doi:10.1097/00043764-200005000-00016. ISSN 1076-2752. PMID 10824308. ^ a b c Toxicology, National Research Council (US) Committee on (1984). SODIUM HYDROXIDE. National Academies Press (US). ^ a b Langford, Nigel J. (2005-12-01). "Carbon Dioxide Poisoning". Toxicological Reviews. 24 (4): 229–235. doi:10.2165/00139709-200524040-00003. ISSN 1176-2551. ^ "OSHA Technical Manual (OTM) | Section IV: Chapter 5 - Pressure Vessel Guidelines | Occupational Safety and Health Administration". www.osha.gov. Retrieved 2018-11-24. ^ "TABLE 1. Incidence rates of nonfatal occupational injuries and illnesses by industry and case types, 2017". www.bls.gov. Retrieved 2018-12-10. ^ Chen, Jong-Dar; Tsai, Jui-Yuan (2003). "Hearing Loss among Workers at an Oil Refinery in Taiwan". Archives of Environmental Health: An International Journal. 58 (1): 55–58. doi:10.3200/aeoh.58.1.55-58. PMID 12747520. ^ WACHASUNDER, SUDHEER (August 2004). "Assesment of refinery noise impact on workers – a case study". International Journal of Environmental Studies. 61 (4): 459–470. doi:10.1080/0020723032000163146. ISSN 0020-7233. ^ "1910.95 - Occupational noise exposure. | Occupational Safety and Health Administration". www.osha.gov. Retrieved 2018-11-18. ^ "Safety and Health Topics | Occupational Noise Exposure | Occupational Safety and Health Administration". www.osha.gov. Retrieved 2018-11-18. ^ "Safety and Health Topics | Oil and Gas Extraction - Safety Hazards Associated with Oil and Gas Extraction Activities | Occupational Safety and Health Administration". www.osha.gov. Retrieved 2018-12-10. ^ a b "Safety and Health Topics | Oil and Gas Extraction - Safety Hazards Associated with Oil and Gas Extraction Activities | Occupational Safety and Health Administration". www.osha.gov. Retrieved 2018-12-10. ^ a b R.D. Kane, D.C. Eden, and D.A. Eden, Innovative Solutions Integrate Corrosion Monitoring with Process Control, Mater. Perform., Feb 2005, p 36–41. ^ a b Corrosion Costs and Preventive Strategies in the United States, a publication of NACE International. ^ Amin, M. S.; Hashem, F. S.; El-Gamal, S. M. A. (2012-07-01). "Thermal resistance of hardened cement pastes containing vermiculite and expanded vermiculite". Journal of Thermal Analysis and Calorimetry. 109 (1): 217–226. doi:10.1007/s10973-011-1680-9. ISSN 1572-8943. ^ "CDC - NIOSH Program Portfolio : Oil and Gas Extraction : Economics". www.cdc.gov. Retrieved 2018-12-11. ^ "Safety and Health Topics | Oil and Gas Extraction | Occupational Safety and Health Administration". www.osha.gov. Retrieved 2018-12-11. ^ "NOTICE PUBLICATION/REGULATIONS SUBMISSION" (PDF). www.dir.ca.gov. Retrieved 2018-12-10. ^ R.D. Kane, Corrosion in Petroleum Refining and Petrochemical Operations, Corrosion: Environments and Industries, Vol 13C, ASM Handbook, ASM International, 2006, p 967–1014. ^ E.N. Skinner, J.F. Mason, and J.J. Moran, High Temperature Corrosion in Refinery and Petrochemical Service, Corrosion, Vol 16 (No. 12), 1960, p 593t–600t. ^ E.L. Hildebrand, Materials Selection for Petroleum Refineries and Petrochemical Plants, Mater. Prot. Perform., Vol 11 (No. 7), 1972, p19–22. ^ W.A. McGill and M.J. Weinbaum, Aluminum-Diffused Steel Lasts Longer, Oil Gas J., Vol 70, Oct 9, 1972, p 66–69.